Stylish apartments with top-quality features. Extravagant finishes like quartz and wood plank-style flooring. Hotel-inspired social zones with places to relax and recharge. It's all right here at Modera 44 Apartments. These brand-new beauties signal a new way of living in Morristown. Connected. Social. Supremely comfortable. Walkable. Convenient kitchen and gourmet coffee bar in our resident clubhouse. Rooftop deck with outdoor kitchen is ideal for entertaining. Modern kitchens with stainless steel appliances and moveable islands. Full-size stackable washers and dryers. Gaming and lounge area with flat screen TV. 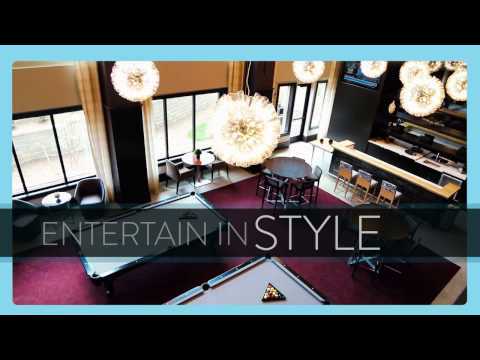 Challenge your neighbors to a game of pool or cozy up to our fireplace and catch up on your favorite shows. Plenty of outdoor lounge space. Outdoor lounge on our rooftop deck. Spacious, open layout floor plans. Sleek subway tile backsplash and dark wood cabinets. State-of-the-art fitness center open 24 hours. Two-story lobby and leasing center. Fire table, and outdoor seating on the rooftop deck. Beautiful wood plank-style flooring in our homes. Come home to Modera 44 Apartments. To experience cool, sophisticated and urbane style in the heart of the Morristown scene, contact us today to set up your personal tour.